Able to fit in tighter spaces, the Nevis hot tub has 3 pumps and all the quality of the Island Spas line from Artesian Spas. The dual footblasters are a nice touch usually only found in larger hot tubs. The Grand Bahama Elite is an 8' hot tub with a wonderfully contoured lounger from Artesian Spas. Spacious foot space and two tiered entry steps accent the ergonomic seating design. Island Elite Spas are Powered with DirectFlow Technology. The two Captain Seats allow you to control water pressure to your own preference creating the ultimate personalized hydrotherapy option. This is unique to Artesian Spas and cannot be found on any other spa in the industry. Dual Footblasters complete your hot tub experience. 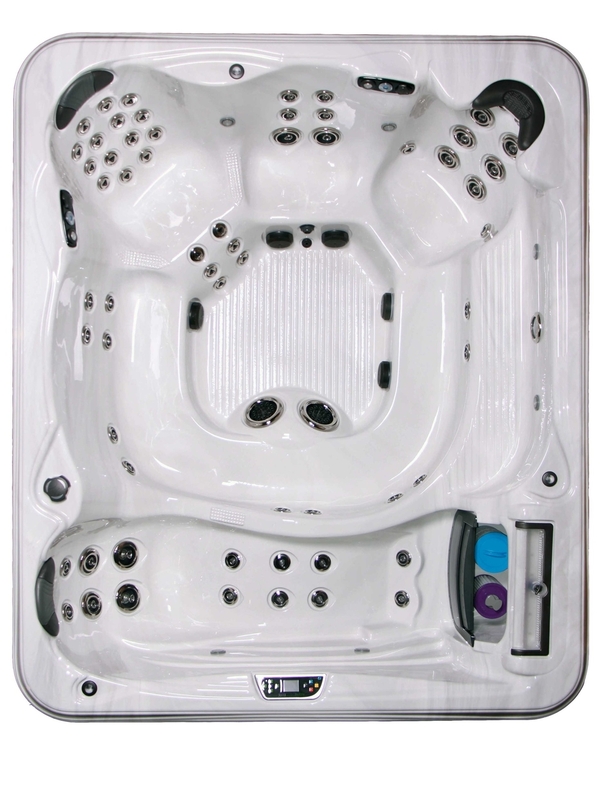 The Grand Cayman Elite is an 8' open seater hot tub from Artesian Spas. 65 jets pepper every seat for a unique massage in every station. The Antigua Elite is the 7' lounger option from Artesian Spas. This hot tub has an ergonomically superior lounger and two high impact Captains Seats. The Captiva Elite hot tub is the premier 7' open seater hot tub from Artesian Spas. Spacious for its size, it boasts a wide variety of jet placement for every seat for maximum hydrotherapy. The double lounger hot tub from Artesian Spas, the Barbados seats 5 comfortably. 3 pumps masterfully plumbed to ensure maximum flow to all stations, the Barbados is a hot tub to be reckoned with. When your hot tub requires a high flow rate but the capacity to seat 8, this is the hot tub for you. Circular bench seating for 8 and flanked by a lounger, the Isla Margarita Elite is both a therapy and party tub. An 11' dual lounger hot tub, the Bimini is the choice for maximum capacity. Friends and family have plenty of space to enjoy this massive hot tub.